Today’s Airfare of the Day goes to Lufthansa and their 2nd level business class excursion round trip fares between Helsinki and the People’s Republic of China. Price: from 1416 € (from 868 € Base Fare + Taxes & Surcharges). Flight restrictions: the fare component must be on any LH/OS flight operated by LH/LX/OS/EN/EW. Minimum stay requirements: travel from turnaround must commence no earlier than 6 days after departure from fare origin or – travel from turnaround must commence no earlier than the first SUN after departure from fare origin. Transfers: unlimited transfers permitted on the fare component. Sales restrictions: tickets must be issued on LH or OS. Tickets must be issued on/before 03JUN 18. 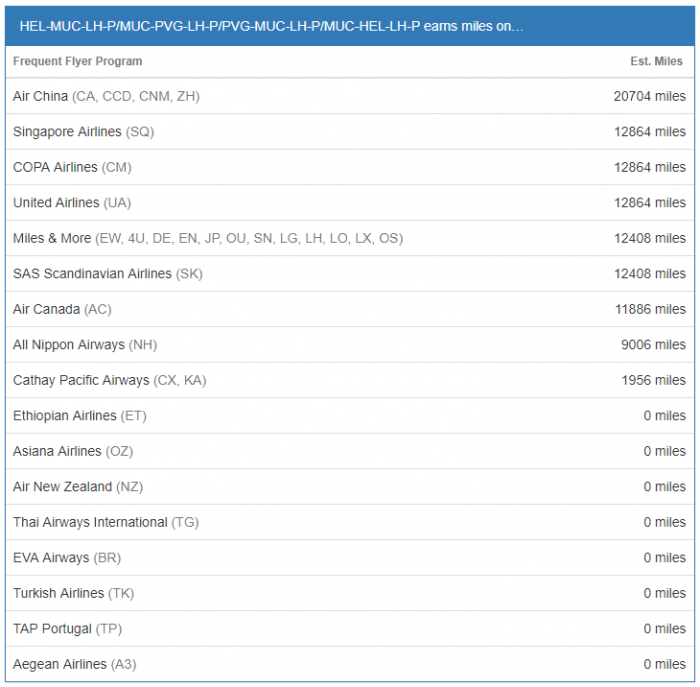 The following accruals were estimated using wheretocredit calculator for HEL-MUC-PVG round trip travel on LH marketed and operated flights without considering any elite status bonuses or ongoing promotions.